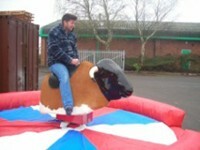 Sherborne Rodeo Bull Hire guarantee you a 'bucking good time' whetever the occasion! yeehaa! 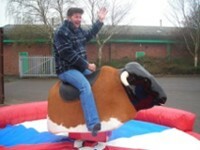 If you're thinking of hiring a Rodeo Bull for your event then look no further your old cow hand. Our mechanical bull is the ultimate in saddle blazing wild west party attractions, it gives great audience participation and of course rider satisfaction! Our Rodeo Bull or Bucking Bronco as it is sometimes called be them city dwellers, is great fun and suitable for ages 10 years and over. It has a whole shooting match of preset riding programs for your western parties, it can go easy for all you mule skinners out there,or like a long horn stampeding for all you trail blazing,leather hide cowboys, as well as manual control for any of those cowboys out there who ride pony express. We also got a large time display so none of you rustlers can be telling too many stories on the trail. Our bull is ideal for private parties, western parties,corporate events, fun days, promotions, weddings any excuse to get in the saddle. hey we can even do the foil helium balloons below. yeehah!